Julius Nepos (Latin: Flavius Iulius Nepos Augustus; c. 430 – 480) was Western Roman Emperor de facto from 474 to 475 and de jure until 480. He was also the ruler of Roman Dalmatia from 468 to 480. Some historians consider Nepos to be the last Western Roman Emperor, while others consider the western line to have ended with Romulus Augustulus in 476. In contrast, the Eastern Roman Empire and its line of Emperors survived this period of history essentially intact. Nepos was elevated to Western Roman Emperor in 474 by the Eastern Roman Emperor Leo I in order to replace the usurper Glycerius. Nepos was deposed in 475 by Orestes, who took control of the government at Ravenna on August 28, 475, forcing Nepos to flee by ship to Dalmatia. Romulus Augustulus was crowned Emperor but was soon deposed by Odoacer. Nepos continued to reign from Dalmatia as the "Emperor of the West" recognized by Constantinople, but in practical terms his power did not extend beyond Dalmatia. Nepos was assassinated in 480, and Eastern Emperor Zeno formally abolished the Western division of the Empire. Julius Nepos was appointed Western Roman Emperor in early 474 by the Eastern Roman Emperor Leo I. Nepos was married to Leo's niece, hence his agnomen of nepos — "nephew". Leo intended to replace the western emperor Glycerius, who he regarded as a usurper. Glycerius had been raised to the throne by the Burgundian magister militum Gundobad in the western capital of Ravenna. Under Roman law, Leo was the sole legitimate Emperor and had the right to select a new western counterpart. Nepos had been governor of province of Dalmatia, technically a part of the western empire but in practical terms an autonomous region since at least the time of the rule of Marcellinus there. In June 474 Nepos entered Ravenna, forced Glycerius to abdicate, and secured the western throne for himself. Nepos spared Glycerius' life and appointed him bishop of Salona. Nepos ruled briefly over the whole of the remaining Western Roman Empire, centered in Italy, still the Empire's heartland, and including his native Dalmatia and the remaining parts of Roman Gaul. 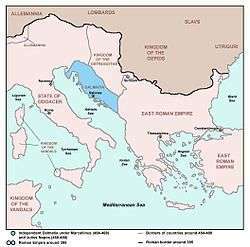 Independent Dalmatia – Extent of Marcellinus' Control (454–468) and Julius Nepos' Control (468–480). Nepos' rule in Italy ended in 475, when he was deposed by his magister militum, Orestes, who took control of the government at Ravenna on August 28, 475, forcing Nepos to flee by ship to Dalmatia. In the same year, Orestes enthroned his own teenage son as the new western emperor with the regnal name Romulus Augustus. The boy was probably around 12 years old when he became Emperor and is known to history as Romulus Augustulus, using the diminutive second element to mean Romulus the Little Augustus. The reasons for Orestes' decision to crown his son as a puppet-emperor, rather than become emperor himself, are somewhat unclear. However, Romulus' position was not constitutional inasmuch as he had not been recognised by the Emperor at Constantinople, in whose eyes Nepos was still the sole Augustus of the West. Romulus' short reign ended on September 4, 476, when Odoacer, head of the Germanic Foederati in Italy, captured Ravenna, killed Orestes, and deposed Romulus. Odoacer sent Romulus Augustulus to Campania in exile or retirement, after which he disappears from the historical record. Although his successor had been deposed, Nepos never returned to Italy. He continued to reign from Dalmatia as "Emperor of the West", and he still enjoyed some support from Constantinople. Odoacer, attempting to bypass Nepos, used the Roman Senate to petition the newly restored Eastern Emperor, Zeno, requesting the title of Patrician, and he sought to end the separate line of Western Emperors. 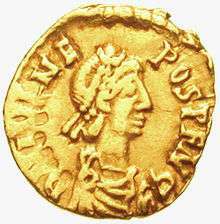 Patrician rank was granted, but at Zeno's insistence Odoacer also grudgingly acknowledged Nepos' Imperial status, and even issued coinage in Nepos' name. In practical terms, Odoacer was increasingly independent King of Italy, nominally recognizing the Empire's suzerainty; Nepos retained claim to the Imperial title, but exercised no real power outside of Dalmatia. In name at least, the Western Roman Empire continued to exist after 476, but only as a legal formality and as a sop to Imperial tradition. This political solution lasted approximately four years. In about 479, Nepos began to plot against Odoacer, hoping to regain control of Italy for himself. Another possibility, (according to some sources) is that Glycerius, who continued as bishop of Salona, was plotting his revenge. What is certain is that Odoacer perceived Nepos as a threat, and was determined to get rid of him. Nepos, still residing in Dalmatia, was murdered by one of his own soldiers in 480, on one of three possible dates — April 25, May 9 or June 22; April 25 is probably the correct one. He was reportedly stabbed to death in his villa, near Salona. Since Diocletian also had a residence in the area, it might have been the same building. Marcellinus Comes blames "the treachery of his comes Viator and Ovida" for the murder. Malchus also implicates the former Emperor Glycerius in the conspiracy. Glycerius was after all Bishop of Salona at the time, placing him in the vicinity of the murder. Ovida served as the next ruler of Dalmatia for a few months, but Odoacer used Nepos' murder as a pretext to invade Dalmatia. Odoacer defeated Ovida's forces on December 9, and added the province to his own kingdom. Adding to the suspicions about Glycerius is a report that Odoacer then made him bishop of Milan. After Nepos' death, Zeno formally abolished the division of the Empire. As is the case with many Roman Emperors who reigned for only a short period of time, particularly those from the final decades of the western empire, there is only limited information about Nepos available in surviving records. Historians claim  that Julius Nepos was son of the comes Nepotianus, a general (magister utriusque militiae) who served the Western Roman Empire between 458 and 461 during the reign of Majorian. Nepotianus is mentioned as having been active in southern Gaul and in Hispania, eventually dying in 465. His unnamed mother was a sister of Marcellinus, magister militum of Dalmatia. This identification has been denied by historian R. W. Burgess, who starts by observing that the claim reposes on a single passage from Jordanes' Romana. He then proceeds to argue that, while Nepos came from an important family, the general Nepotianus was a mercenary commander working for the Visigoths; from which came his title of magister militiae. Thus, Burgess concludes his argument that Nepotianus father of Nepos, and the military commander Nepotianus, should be considered as two different individuals. The 6th-century chronicler Marcellinus Comes mentions Nepos as "son of the sister of Marcellinus, once patrician". This identification of Nepos is confirmed by a passage in Jordanes' Getica. Since Jordanes often uses Marcellinus Comes as a source, the passage might have been copied verbatim. Marcellinus was a powerful figure in the Western Roman Empire, rebelling in 454 against the Emperor Valentinian III after the latter's assassination of Flavius Aetius. He established himself as an autonomous ruler in Dalmatia, despite accepting the authority of the emperors Majorian and Anthemius. Under Anthemius he was raised to the rank of patrician, becoming a possible threat to Ricimer, the powerful kingmaker behind the western throne. In 468, Marcellinus died in Sicily, probably at the hands of Ricimer. Nepos inherited control of Dalmatia from his uncle, gaining the title magister militum Dalmatiae, and with it a powerbase which would be integral to his future career. Nepos may have been a member of an enduringly prominent Dalmatian family. Four memorial inscriptions commemorating similarly named individuals, from the same region and falling within an appropriate time-frame, have been identified: Aelia Nepotes, Aelia Nepos, Julius Nepos, and Nepotes. The name also seems to be preserved in a church inscription of Salona, dating to the early 5th century. Although the association of the agnomen "Nepos" with his connection to the Leonid dynasty seems to be fairly clear, the origins of and relationships between all these similar-sounding names, including his father's, are less clear. Also unclear is what role Nepos' ties of kinship with Marcellinus might have played in the acquisition of his agnomen. ↑ Ralph W. Mathisen, "Julius Nepos (19/24 June 474 – [28 August 475 – 25 April/9 May/22 June 480)"
MacGeorge, Penny (2002). Late Roman warlords. Oxford University Press. ISBN 0-19-925244-0. Chisholm, Hugh, ed. (1911). "Nepos, Julius". Encyclopædia Britannica (11th ed.). Cambridge University Press. Ralph W. Mathisen, "Julius Nepos (19/24 June 474 – [28 August 475 – 25 April/9 May/22 June 480)"
Arnold Hugh Martin Jones: The Later Roman Empire 284–602. A Social, Economic and Administrative Survey. 3 Volumes, Oxford 1964, S. 244 f. (Reprinted in 2 Volumes, Baltimore 1986). Wikisource has the text of the 1911 Encyclopædia Britannica article Nepos, Julius.